- Very responsive to touch. This case holds the screen on perfectly, and the touch screen still working well with it on. - Great protector without heavy feel. Durable TPU material, soft and flexible. It provides good protection for face and side and most importantly you can¡¯t even tell it¡¯s there. Nice add on for your Apple Watch. -This case covers the entire top and sides of watch, is easy to apply. Great protection for the Apple Watch. -NOT including the smart watch. [Compatible Models] This all-around protective cover only fits for Apple Watch Series 3 and Series 2. Please note that it doesn¡¯t fit for Series 1. The protective cover made of soft TPU, which is flexible to install on the watch. [All-around Protection] Full cover soft TPU protective case for Apple Watch Series 3/2. It includes the screen protector to cover your watch face, a nice cover to provide all-around protection to your watch. [Precise Reserved Hole] Precise molded TPU protective cover for Apple watch, it¡¯s thin and blends in well with the watch face. So it doesn¡¯t interrupt button pushing. It is hardly to notice that there is a case on!? [Responsive Touch Screen] Ultra-thin protective cover that perfectly fits your watch face, it does not interfere with the responsiveness of the touch screen. This adds a nice touch without adding size. 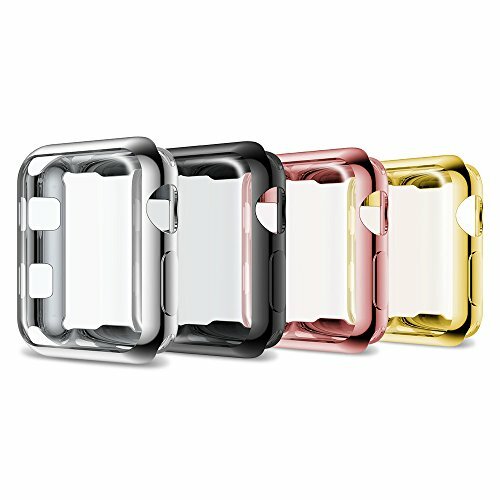 Package content: 4*tpu protective case(1*silver,1*black,1*gold,1*rosegold). NOT including the smart watch. [Lifetime Customer Support] 6-month warranty and lifetime tech support. We are happy to resend a replacement band or accessory if there's any quality issues of the band. Please kindly contact us once there's any technical problems or quality issues. We're always here for you.